I’ve been doing it again – going meeting strangers from the internet. Don’t ever tell my children! This time, I was mega brave and joined in the first meeting of the Clandestine Cake Club in Manchester. 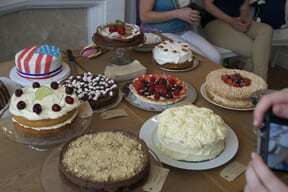 Organised by Gwyneth of Vintage T’s, we all met at 6PM at The Cake Gallery in Bowden armed with our cakes. That makes it sound so simple – in actual fact my day had been horrendous up until that point. Trying to bake a cake, deal with a teething, roasting hot baby and sort the washing after a weekend away does not make for a calm cake-maker. We were given a theme of USA with it being American Independence Day so I decided to make Oreo cake with Vanilla Frosting. 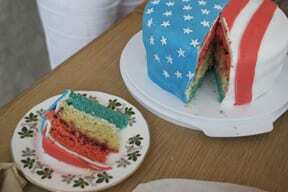 The other cakes on offer were New York Cheescake, Lemon and Blueberry Bundt, A Stars and Stripes cakes which was cleverly coloured red, white and blue too, Angel Cake and Mississippi Mud Pie. We were encouraged to photograph the cakes (phew, I once again had forgotten to take a pic beforehand of mine) and then it was time to dig in. Amazing how quickly you get full up when you are overfaced by all the delicious goodies. We sat and chatted as we filled our faces and the time went so quickly – I can highly recommend joining a cake club evening. Its a brilliant way of learning about how other people find recipes, how they decide on ingredients and just testing something new. Air con is a really good way of keeping your cake cool on the way, however you will not be able to feel your toes by the time you get there! I have no sense of portion control – I thought my cake was tiny until I got there. This will be no surprise to people who know me and my problem with wanting to feed an army. Even though you think you will never want to eat cake again, less than 4 hours later I am sitting here with a slab. I’m going to be really kind and share my recipe for the Oreo Cake – make it today! Pour into 2 x 20cm cake tins and bake at 180C for approx 40 mins each or until a skewer comes out clean. I love the way you’ve decorated this cake, simple elegant and very pretty. 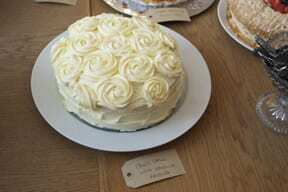 I’ve booked to go to Newcastle’s first Clandestine Cake Club next week, I’m really looking forward to it. Wow, looks like I missed a treat or 8? Can’t wait to hear all about it. Omg you mean you bake a cake, take it somewhere and then get to sit and eat loads of cake? Why have I never heard of this type of club before? That is my idea of heaven! This cake looks amazing, I can’t wait to give it a try soon. Lovely cake Helen, looked beautiful, my daughter Daisy bagsied it to finish off when she’s home from school today! Thanks for coming, great to meet you. I love this idea and wish i could have been there but i work Mondays, please please please canthe next one not be on a Monday! All the cakes look amazing but your Oreo cake is the prettiest, I was about to say too good to eat but no cake ever looks too good to eat! 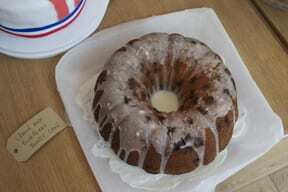 Great post-loved your cake too! 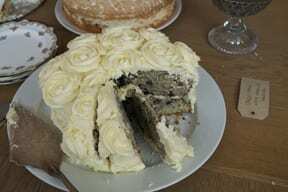 Lovely post about Clandestine Cake Club, Many thanks to Gwyn for organising it, you did a great job. So glad everyone had a good time. Great cakes as well. Hope to meet you all at a future event. Looking forward to Afternoon Tea on Sunday. Gwyn certainly did a fab job – it was a lovely atmosphere. Thanks for dropping by. Oh this looks fab. Do let me know if there is another one, I’d love to come. Love the decoration. I just can’t decorate cakes prettily to save my life. Thanks! Will let you know – hopefully one around here Sept/Oct time. I would like to volunteer my services to the cake club. I would be willing to fly over from n Ireland to act as taster for each of those cakes. Honestly no I don’t mind doing it.